Do you want some fun reading? 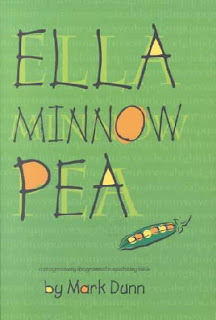 Mark Dunn's Ella Minnow Pea: A Novel of Letters fits the bill. You will meet Ella Minnow Pea who lives on an island named Nollop after the famous Nevin Nollop who was the creator of the immortal phrase "The quick brown fox jumps over the lazy dog." Nollop is off the coast of South Carolina. The blurb from the Philadelphia Inquirer on the back jacket states, "A curiously compelling...satire of human foibles, and a light-stepping commentary on censorship and totalitarianism." Julie and I both convulsed with laughter reading this "zany book." Now I want to read it...again! Okie dokie...you'll laugh your way through it again.